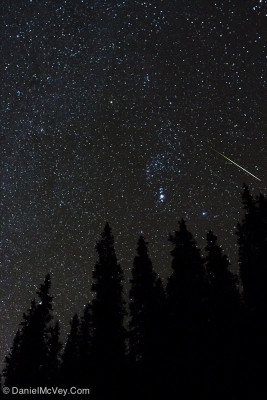 The Orionid Meteor Shower is named after the constellation Orion "The Hunter", because the meteors appear to "radiate" or come from just north of Orion's bright star named "Betelgeuse." You can find the constellation Orion prominently in the south-east sky. This meteor shower is produced as Earth's orbit crosses through the dust and debris trail left by the solar system's most famous comet "Haley's Comet". Haley's travels around the Sun every 76 years, last passing us in 1986. This meteor storm could bring as many as 25 per hour as we pass through the debris field with higher bursts. The best place to view the meteor show around Philadelphia would be any place away from the Center City lights and in an open field. Even though there is a radiant point in the south-east sky, you can see them fly anywhere above. Watching later in the night closer till dawn should see the best results. Be sure to bundle up!